Skateboarding has globally loved the game and gives you an exhilarating experience. Skateboards come in two options; either you get a complete skateboard that is pre-assembled, or you get separate parts and build your custom skateboard that is best suited to your style of skateboarding. Most people go for the readymade option, but if you are skateboard junky and want to design your skateboard, there are precise instructions that guide you through the details about the right size and shape of the decks, trucks and other components, which make up the skateboard’s body. These instructions are also valid for your already owned skateboards if you want to replace or upgrade any part. There are few things that, you should be aware of before ordering the DIY skateboard kit. For example, if you are presenting it to your friend, then you should know the height of your friend and the kind of skateboarding. Moreover, you can also make sure that you get the skateboard belonging to specific brand your friend likes. Consider this a general guideline about how to assemble a typical skateboard with parts that will assist you in riding skateboard in your style. All said, if you want to make your own rules in assembling the skateboard according to your own preferred style, by my guest. Other than that, this will provide you with general guidance. The board of the skateboard is known as a deck, and it holds the weight of the rider. 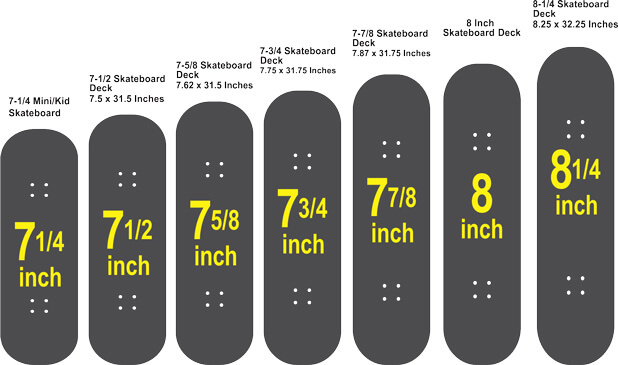 The chart of sizes of decks is meant primarily for the beginners and intermediate as a general overview about the size of the deck that is ideal for a certain height of the rider. Once you get the feel of a skateboard, you can get the deck, whichever suits your style. The following chart will help you decide the size of the deck to choose according to your height. The width of the skateboard to get depends on the size of your feet as well besides your height. Mostly 7.5″ to 8″ wide decks are used but they can vary in size and be narrower or wider. After deciding about basic size, you can modify it a little bit according to your style of skateboarding. For skateboard transition or vert, for riding ramps frequently or riding in skate park, wider deck is recommended which can be 8″ or wider. On the other hand, if you are into performing tricks more and ride around streets, decks under 8″ width are most suitable. However, if you are not planning to perform tricks and just like to cruise, than keep a wider deck as it provides more stable ride. Again, these are only general guidelines. If you have something specific in mind, go for it. Another thing to keep in mind for the parents especially; choose the graphics for your kids that they like as this will make a difference in enhancing or diffusing his or her interest in skateboarding. Diameter: Meaning the height of the wheels. It is measured in millimeters for skateboard wheels. Durometer: It is the degree of hardness of the wheels. Most wheels manufacturers use A-scale. This is something that needs not to dig in deep to understand. All you need to know is that, higher the number, harder the wheel. For instance, for an average skateboard wheel, A95 hardness is used while softer wheels can go as low as A70 and even lower. Most skateboarders feel comfortable with 52mm to 54mm with durometer 99A. However, choosing a specific diameter and durometer totally depends on what kind of style you enjoy while skateboarding. These stats make all the difference as far as quality of your ride is concerned. Wheels used with larger skateboarder spins a lot faster. For rocking ramps, you can try 55-65mm wheels with a durometer of 95 to 100A. Many ramp skateboarders use even bigger wheels. A few manufacturers like Bones have a unique formula for their wheels and do not use durometer. Smaller wheels are used by skateboarders who like to perform flip tricks, as they are light in weight and are nearer to the ground. This feature makes it easier and faster for the skateboarders to do the tricks. For such enthusiasts, 50-55mm skateboard wheels are best with hardness range from 97 to 101A. Again, Bones use individual Street Tech Formula wheels, and they work perfectly well for optimum performance. When you are aiming to strike a balance between two extremes, you can try 52-60mm wheel size and 95-100A hardness. This kind of stats in wheels provides you with a balance between speed and weight. Commonly, cruising wheels are not ideal for speed as they are much bigger and softer for riding on rough areas and terrains with a durometer between 78-85A. There is another variety of wheels available in the market for cruising such as huge dirt wheels with knobs, but they are not recommended for a skateboard. Bearings are little metal rings that are housed inside your skateboard wheels. Bearings are rated using ABEC rating standard and range from 1 to 9 but only odd numbers. As this rating system was just devised to rate the bearings in machines and not on skateboards, so it is used only used to rate the precision of a bearing. The more precise the bearing, the weaker they are. Bearings are the most abused part of the skateboard. Ideally, skateboarders are looking for bearings that are both precise and durable. For that, ABEC rating is 3 or 5. These are smooth, yet they will not break when you jump on your board. Some skateboard bearings do not follow the ABEC ratings. Best way to get optimum performing bearings is to try out some, ask a friend or a pro or better yet, ask the salesperson who knows his bearings. A point to note; do not rush into getting the most expensive bearings available thinking them to be most durable ones. You can get the same quality in the medium priced brand. The width of the trucks should match that of your skateboard deck. Various brands have their charts that you can consult to do the matching. Your trucks’ width should be within ¼” of the size of your deck. Bushings are the small parts that are housed inside the wheels and looks like rubber rings or donuts. The bushings provide a cushion to the trucks while turning. For stable skateboard, bushings should be stiff. Softer bushings, on the other hand, are easier to turn. If you are an amateur and are starting your skateboarding journey, stiffer bushings are recommended which will break in over a period. Medium bushings are best for intermediate level skateboarders, and soft one is best for the skateboarders who like to carve a lot. Height of trucks varies according to the style of skateboarding you are into. Low trucks are ideal for flipping tricks and provide a little stability. With lower trucks, you have to use smaller wheels. High trucks can be adjusted with bigger wheels that are ideal for higher speed and long distance skateboarding. For amateur skateboarders, medium trucks are ideal unless you want to use a skateboard for street or cruising. Low trucks are best for roads while medium to high trucks is an excellent choice for cruising. There are miscellaneous items that you have to look for before making the purchase. Usually available in black colour, this sand-paper-like top layer is helpful in keeping your feet stuck at one place by providing you with grip. Depending upon how much time you are spending on the skateboard, you can also get finer grip tapes as well for your skateboard to provide you maximum grip while riding. They can be already attached or you can stick them yourself as well, designing them in your own style and to your liking. Risers perform multiple functions. They assist in relieving stress from the trucks that keep the deck from cracking. They help keep the deck safe from wheel bite that can cause the board to stop abruptly on a hard turn. Most commonly available risers are about 1/8″ high. For extra-large wheels, you will need much higher risers. Also, for the wheels that are small with 52mm eight, then you do not need the risers. Nuts and screws that glue the skateboard together are vital components that you might pay attention to. You can get coloured nuts and bolts as well according to your liking. If you are building a board for the first time, you might want to get help from an expert, most probably from someone at the skateboard shop. Otherwise, order the complete set, which will allow you to customize your skateboard as well. If you are going to assemble the skateboard yourself, there are various helpful tutorials available on YouTube that can help you through the whole process with ease. However, if you are new to this sport or not, it is better to get your local skate shop to assemble it for you. While skateboarding or trying out your newly assembled skateboard, pay attention to things that you do not like while riding. Once you have the feel, you can rectify the fundamental problem. There is only one thing that matters; having fun that is, so HAVE FUN! You can get a readymade option as well as a complete set and build your custom skateboard designed according to your style. You can enjoy both kinds of skateboards and get maximum quality rides. However, when you develop your skateboard, you can choose the parts that complement your riding style. You can design your skateboard according to your method aesthetically speaking. Just be sure to assemble the skateboard right or better yet, get your local skate shop to do it for you.